Review Opti-Free Express Duo Pack Competitively priced when compared to the High Street or local Opticians prices. Review Opti-Free Express Duo Pack This is the best solution I have used. Never dry (unless my lenses are old). Review Opti-Free Express Duo Pack I have used this for some years and found it very effective, both for day to day use and for rinsing new lens prior to wear. Not the cheapest solution, but still reasonable value, especially with the free lens holders included. Review Opti-Free Express Duo Pack Like this product. Review Opti-Free Express Duo Pack Contact lenses very comfortable using this product. Would buy again. Review Opti-Free Express Duo Pack It is a really good contact lense liquid. Always use this one and never been disappointed!!! Review Opti-Free Express Duo Pack Good value for rmoney & good product! Review Opti-Free Express Duo Pack Excellent stuff! Review Opti-Free Express Duo Pack For me it is the best! Review Opti-Free Express Duo Pack The best non-rub solution. Review Opti-Free Express Duo Pack Very happy with the product, works for me. Review Opti-Free Express Duo Pack Very good value for money, very soft to the eyes. Review Opti-Free Express Duo Pack Easy to use, good value for money. 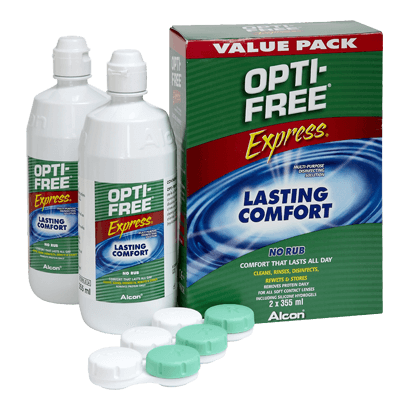 Review Opti-Free Express Duo Pack Always used this product for my contact lenses, it is easy to use and I have not had any. Problems with my eyes. My lenses feel very comfortable and I can wear them all day. Review Opti-Free Express Duo Pack Excellent value for money and does exactly what it says. Would definitely recommend. Review Opti-Free Express Duo Pack Since using this product I have found it so much more beneficial than previous ones. Review Opti-Free Express Duo Pack Opti-free has been my staple brand for contact lens solution while I've been wearing lenses. I generally prefer the Express solution rather than Replenish, though both are good. These duo packs are great value for money, and even better, they come with free contact lens boxes, so you don't need to worry about hygiene when changing your lenses each month. Review Opti-Free Express Duo Pack Best solution I have ever used., and I've tried a fair few over the years! Review Opti-Free Express Duo Pack A good lens cleans that's easy to use. My optician never has Any problems with the condition of my lenses even when I've been wearing them for nearly a month. Good value for money. Review Opti-Free Express Duo Pack Great product - I've been using it for 20+ years. Great vision. Super price from Vision Direct. Review Opti-Free Express Duo Pack I've tried all varieties of lens cleaners and this is by far the best. Review Opti-Free Express Duo Pack By far the most comfortable contact lens solution I have tried, even over long periods of extended wear. Very simple to use and no lens rubbing required. Review Opti-Free Express Duo Pack I've been using this solution (and the older versions of the same product) for over ten years with no problems. The pack is good value as it comes with three lense cases. The solution bottle cap can easily be opened with one hand and the cap stays back out of the way. The lense cases are the best on the market - I've tried lots. Review Opti-Free Express Duo Pack My favourite contact lens fluid. Reasonably priced if you can get a bulk deal online. Offers good comfort. Review Opti-Free Express Duo Pack Best product for lenses that i've ever tried. Opti-Free Express Duo Pack Very happy with this product! Opti-Free Express Duo Pack Easy and quick to use, cleans lenses properly. Opti-Free Express Duo Pack I have used this solution for 5 years and think it's great. Opti-Free Express Duo Pack The no rub formula is great and saves you so much time. Best solution I have found so far! Opti-Free Express Duo Pack Easy and quick to use - brilliant for my silicone hydrogel lenses. Review Opti-Free Express Duo Pack Brilliant contact lens solution which I have used for over ten years. I have tried other solutions, when they have been provided as a package with contact lenses from an opticians, but none have come close to the quality of this solution and so I have always bought this even when there was a solution free. Simple to use - you don't even have to rub your lenses. Just take them out, put them in the solution, then take them out of the solution in the morning and put them straight back into your eyes. Simple as that, no time wasted. Feels comfortable and cleans lenses well. My favourite I had already used the opti-free for years. It is never made me disappointed. It is the best i use! Bit pricey but good Have used the product for a number of years and have no reason to change. I am not considering any alternatives at present, but would do so if the same performance were available at a lower price. Good cleaner This solution has proved best for me over a period of time. It cleans well, and does not appear to dry out as quickly as some. eg Alencon. Simple I like the product s it is easy to use and all in one. It was recommended by my optician. Best I've found Tried a couple of other products, but found this to be the most comfortable. Easy No rub, Easy to dispense. Replaced Specsavers own solution. A multi-purpose cleaning solution, Opti-Free Express Duo Pack will ensure your lenses are free from any bacteria or protein. In addition, the trademark TearGlyde reconditioning system creates a layer of moisture by working with your natural tears. This gentle layer also prevents unwanted formations such as protein or lipid deposits. So that right from the second you insert the contact lenses in the morning until late at night, you will never feel the slightest discomfort. This makes Opti-Free Express perfectly suitable for people with dry and sensitive eyes. The proven dual disinfectant system in the solution protects your eyes from harmful bacteria that could cause eye infections. It also prevents red eyes and reduces oily build ups for clear vision. Recommended for disinfecting, rinsing and cleaning of all kinds of soft contact lenses, including silicone hydrogel lenses, Opti-Free Express is a safe and healthy formula for a truly comfortable lens wearing experience.